At Arbor Crest wine making is a family tradition. Born into a family that had farmed in Washington State for over a century, brothers Harold and David Mielke discovered in the late 70's their land had enormous potential to grow grapes for producing fine wines. Their dream became a reality in 1982 when they, along with Harold's wife Marcia, established Arbor Crest Wine Cellars. Arbor Crest was the 29th winery established in Washington State. Today, there are well over 650 wineries in Washington State, making Arbor Crest Wine Cellars a Washington wine industry pioneer. 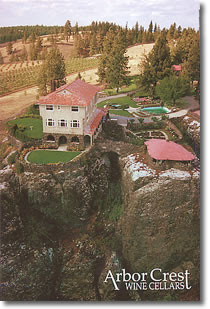 Two years later in 1984, the Mielke family purchased the Riblet Estate and relocated the winery to the estate's Cliff House, perched high atop cliffs overlooking the Spokane River 450 feet below and providing outstanding views. The Cliff House, a National Historic Landmark was built in the Florentine-style in 1924 is a picturesque winery complete with awe-inspiring views. Arbor Crest boasts one of the most spectacular settings of any winery in the Washington State and is worth visiting for this reason alone. The Cliff House is a 75-acre estate with breathtaking gardens which surrounded the estate landmarks, including a gazebo, croquet court, and famed life-size checkerboard. The current tasting room blends in well though it was built in 2003. An unfortunate 2009 fire damaged the historic Cliff House, but the owners assured the heartbroken public, it can be restored to its original splendor. December 2010 marked the completion of this careful restoration. This is a destination winery, perfect for a picnic and available to rent for weddings and events. The tasting room staff is one of the most well-versed in the nuances of the wines. There is a small 5-acre vineyard at the site that adds to the romance. Its fruit is used to produce an estate-bottled sparkling wine, otherwise the wines like most Spokane wineries are made from grapes grown in the Columbia Valley AVA . A popular Arbor Crest wine is Dionysus, which is a blend of Cabernet Sauvignon, Merlot and Cabernet Franc. Currently its the Syrah that is my first choice, followed by the Malbec. As you may know, wines are named after the grapes, but blends give the winemaker the opportunity to name it at will. The limited release red-blend Dionysus, is named after is the god of wine, the inspirer of ritual madness and ecstasy. Also highly recommended is the luscious Arbor Crest Sauvignon Blanc which is a nice pairing for a Summer picnic. Arbor Crest's winemaker, Kristina Mielke-van Loben Sels, is a second generation winemaker. Daughter of Harold and Marcia, she is a graduate of the University of California Davis in Fermentation Science. Mielke-van Loben Sels spent seven years as the associate winemaker of Ferrari-Carano Vineyards and Winery of Dry Creek Valley in Sonoma County in California, before she and her husband Jim, a viticulturist joined the Arbor Crest Wine Cellars staff. Using grapes grown in the Columbia Valley, Red Mountain, and Wahluke Slope, Arbor Crest produces a wide variety of wines. Named by Wine Spectator as one of the "Top 50 Producers Every Wine Lover Should Know," Arbor Crest Wine Cellars is best known for their Sauvignon Blanc and their red blend and my favorite, Dionysus. Summer concert series in the event tent nestled in the vineyard. *Arbor Crest participates in Spokane Wine Association events such as the Mother's Day Spring Barrel Tasting Weekend, as well as, the November Holiday Winery Tour. *Private tours of the Cliff House can be pre-arranged other times during the year and include wine tasting plus a gourmet lunch. *Wine tasting is available daily and guests will learn the true portrayal of the superior-quality of Arbor Crest wines that are part of the Washington wine industry. *Arbor Crest also has a downtown tasting room in Riverpark Square. I agree. The summer concert series is a pretty enjoyable way to spend an evening.